Speech recognition or Voice Recognition is not an easy thing to do. You all must have seen people struggling with advanced voice recognition tools like siri even though it is being developed by worlds best engineers. Still in this article i will show you how to recognize between a limited set of keywords. And trust me it is very fun to do an on board Speech recognition instead of connecting it to the Computer and using its huge processing power when our task isn’t huge. I was attempting to do this totally on-chip with my Atmega128. but Alas!! it has very limited processing power plus it is not an MSP to process such signals. So instead i moved on to do it with an external Voice Recognition module. 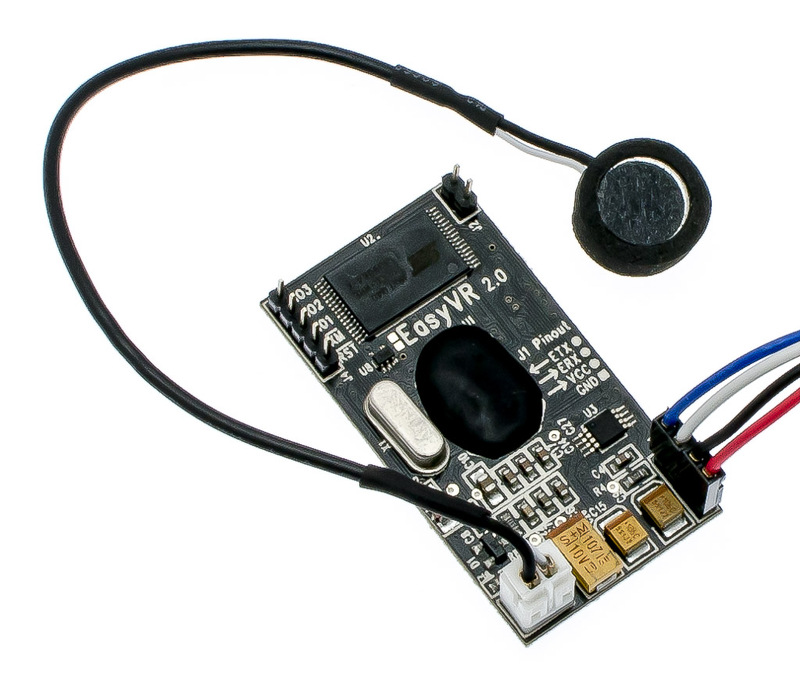 EasyVR is a voice recognition module by veear co. from TIGAL corps. It has this Serial interface to be connected, an EasyVr commander to train the commands and everything you need to do the recognition part. In this tutorial I will show you how to interface EasyVr with your AVR based embedded project. Its available everywhere, check sparkfun if you cant find it. after that connect easyVr to your serial port as per the following diagram. If your system don’t have a serial port, buy a USB to serial (TTL) converter. Open EasyVr commander, choose the port it is connected to and press connect. Check 4– Interface it with your Embedded system. Burn the code and when is done it will print L on your LCD and there you should speak one of those keywords you fed into that system. When done listening it will print D and display the index of the command on LCD. Well, as this one is a stamp it has its own protocol to follow, to initiate request and acknowledge everything, It is done well on the above code on library side so it wont be a problem from user side. The Stamp works on UART protocol with 8bit, 1 stop bit and 0 parity. We have covered it here, so check it for reference. here are these functions from the library i ported. Actually check this code below, you will get its functionality. The result value is returned in _value (and idx variable in main file) Use that index to manipulate and for using it in Other projects. Playsound coding is done internally inside that module. Its not done anywhere on-chip. can you give me sample code with playsound?? I’m still a little not understand.. This entry was posted on May 4, 2014 by S4t4n in random stuff.